Valentina Amaro holds up a #ThisIsEmerson sign during the walk out. SouJee Han speaks to hundreds of students in the Dining Center during the sit-in Tuesday. Co-chair of POWER Celia Reilly speaks to the crowd in the Dining Center. Chris Henderson-West speaks to faculty and students in the Robert J. Orchard Stage. Over 300 Emerson students marched into the college's monthly faculty assembly meeting Tuesday, protesting college complacency toward discrimination against students of color. About 80 full-time faculty members looked on from below as students poured into Paramount Theatre’s second floor balcony chanting, "No more oppression, no microaggressions." A group of nine student speakers and protest organizers gathered at the front of the stage to share their grievances and impassioned accounts of their experiences as students of color at Emerson. The protest was shared with students on social media Monday night using the hashtag #ThisIsEmerson to gather accounts of bias on campus. Many of the speakers said they’ve had to educate their professors and peers, who depend on them for a level of cultural competency they believe the administration should be responsible for. Tuesday wasn’t Tshitundu’s first time protesting in front of faculty. 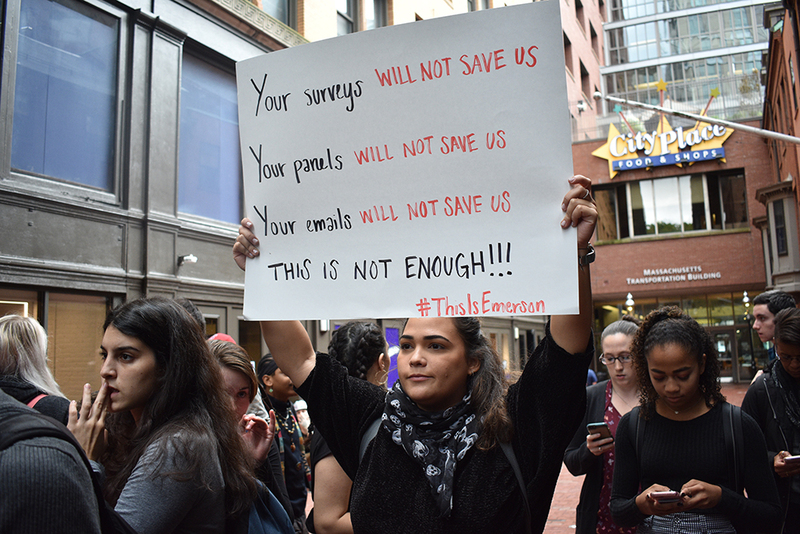 The #ThisIsEmerson protest comes two years after a similar student-led demonstration in the spring of 2015, when several hundred students marched into the final faculty assembly of the year demanding campus-wide cultural competency and sensitivity classes. “If this looks awfully familiar to you, that’s because students of color have been dealing with the same thing at this institution for years,” said Lucie Pereira, co-chair of Protesting Oppression With Educational Reform and one of the lead organizers of the event. In their mission statement on Facebook, organizers urged students to take a stand. “In a time when Nazis hold rallies across the street from our campus and white nationalist flyers are found in our dorm and classroom buildings, we must actively stand against all forms of hate and oppression,” they wrote. The event page was put together by a collective of students with ties to cultural organizations. The protest’s mission statement also asked supporters to sign a list of demands posed by POWER on a Change.org petition. These demands included the creation of at least five scholarships for students of color and the factoring-in of bias reports during faculty tenure review and promotion. The petition garnered 2,040 signatures as of Thursday morning. In a campus-wide email, President M. Lee Pelton said Emerson is committed to quickening the pace of change on campus. “While the College has made progress in certain areas of its commitment to diversity, inclusion and social justice, there is still more good and effective work to be done. I look forward to working with faculty, students and staff to continue our progress in these critical areas,” he wrote. Pelton did not directly address any of the petition’s specific demands in his email, including a redesign of the First-Year Writing Program and Fundamentals of Speech Communication, as well as online cultural competency training for new students. On Tuesday night, an anonymous user created an inflammatory Twitter account with the handle @RealEmersonian to criticize the protest. The account posted a picture of a police officer spraying protesters with tear gas captioned: "How ECPD should have handled today's demonstrations #ThisIsEmerson." The tweet was deleted and the account was briefly deactivated. Many students at the faculty assembly said not enough had changed despite the demands made at the 2015 protest. “People have been telling us yet again, ‘I think you need to have another protest,’” said Lissa Deonarain, the president of Flawless Brown and another one of the lead organizers of the event. POWER Correspondent Julio Villegas posed a direct question to the audience of educators, asking them to consider why they chose to teach at Emerson. While Villegas was speaking, associate professor and faculty assembly chair Anthony Lowrie interrupted to tell students that the petition had gained one more signature—his. Lowrie said though he didn’t know about the protest beforehand, he was happy to have students there. After students said their final remarks and marched out of the theater, faculty stayed behind to go over each of the demands posted on the petition. Hours later, dozens of the protesters crowded onto the Dining Center stairs for the second half of the protest, where many who couldn’t speak at the faculty assembly shared their stories. While participants in the sit-in stood up and spoke, other students in the Dining Center continued eating, talking, and walking past protestors sitting on the stairs. Sophomore performing arts major Amalia Gonzalez addressed the seated students. “Sitting idly by and watching doesn’t make any change,” Gonzalez said. At the faculty assembly earlier that day, Tshitundu earned a standing ovation from the crowd when they asked the faculty to remember just one thing from the day’s events. “Even if you can’t remember any of our names, even if you're like ‘Yeah, that one with the bald head and the piercings,’ even if that's how you have to think of me—still think of me as a human being, deserving of respect in every space that I enter,” Tshitundu said. Max Reyes contributed to this report. Editor-in-Chief Nathanael King did not edit this article.